Who says 3D printing isn't a viable manufacturing process? The Salen Compensator (named for Kenneth Salen, competitive Norwegian IPSC shooter) shows it can be done. Tonrud Engineering manufactures the Salen Compensator and a write up about the compensators themselves is on The Firearm Blog. Note the flat support structure visible through the side holes on each compensator. These are required as part of the manufacturing process, but will be removed with post-processing. When printing in plastic, support structures are normally only for supporting the geometry of the part. But with printing in metal, support is often used to provide stability across the parts of the entire model; otherwise some warping can occur as smaller and thinner parts cool faster than larger areas, leading to deformation. 3D printing can be used not only for manufacturing, but for cheaper and faster prototyping and to open new doors. 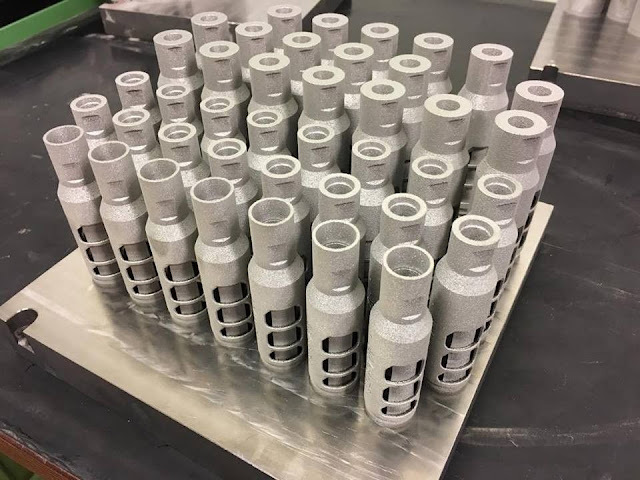 For example, 3D printing in metal can be used to create suppressors in strange, nontraditional shapes like those shown below. These are shapes that would be impractical or impossible to create using any other method. In the image shown, the barrel of the gun goes into the hole on the left. The bullet exits from a hole inside the "wedge" on the right.